Did you watch the Winter Olympics this year? While it’s always exciting to observe people going down a solid path of ice at 80 mph or ski jumping a couple hundred feet off of a tiny ramp, this is serious business for these athletes, and success or failure is often measured in inches or fractions of a second. Everyone is naturally competitive, and sports is the American forum for raw competitive spirit. However, it’s probably the worst attribute of real estate. While we enjoy watching close matches on TV, we have no desire to experience that same level of competition in our investments. One of the big attractions of the mobile home park industry is that few people desire to be in it. That’s probably the result of the incredibly negative stigma that the media has cast on the industry for decades. So while the Olympics may be a fun showcase of the best of the American spirit of battle, we are certainly glad not to be Olympians in the real estate arena. We’ll take no to low competition any day. How long will the industry be able to offer this unique dynamic? Certainly for a while yet, as the media is relentless in convincing the average investor that “trailer parks” are a bastion of hillbilly idiots and thugs. Private equity groups, on the other hand, have already figured out the truth, but are focused – to date – on acquiring large portfolios (Northstar and YES) or lifestyle glamour properties (Carlyle). As a result, if you are buying classic affordable housing communities, you can continue to operate in a low competition mode for the time being. But once mobile home park buyers start wearing numbers pinned to their shirts – and cap rates are bid down to one-thousandths of a point -- it’s probably time to get out and start practicing the triple-axle and your luge skills. 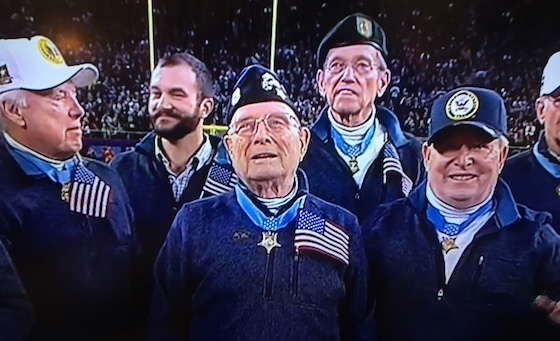 This year’s Super Bowl featured a group of World War II veterans that are part of the G.I. Generation – defined as those who were born between prior to 1927. When you include those also known as the “Silent Generation” – defined as those born between 1928 to 1945 – this macro population segment is widely known as the “Greatest Generation”. This is also the most common population group for buying mobile home parks directly from the original builders and owners. So what’s so “great” about them? Any way you cut it, these are the people that truly built America. Virtually every major building and piece of infrastructure in the U.S. was directly built, designed, and funded by this group. That includes most downtown areas (1940s), the Interstate Highway System (1950s), and the American suburbs (1960s). It also includes virtually every mobile home park in nation (1950s to 1970s). There has never been a more prolific group of people, and there probably never will be again. You can’t build America without learning a lot in the process. The depth of knowledge of this group is astounding. They knew it all before Wikipedia was invented. When we first got in the business, all of our information on what to do came from old-timers who were willing to share their lessons learned. And these people know something about everything – from evictions to plumbing. If you talk to park owners, you will find that the best deals they ever bought were situations in which mom & pop liked them and gave them a real boost in offering a price and/or terms that made the deal a guaranteed success. It’s hard for people to believe, but these great prices were deliberate and not the result of having no idea of what the correct price would be. These sellers are more concerned with issues other than money. That’s why they are the Greatest Generation – because they truly care about others and their welfare. That’s why so many of them gave their lives in military conflict; because they sometimes care more about others than they care about themselves. We find it tragic that today’s young people will have little contact with the Greatest Generation, as these are the best role models the U.S. has ever known. They are the epitome of everything great in our nation, and without them we would never have the quality of life that we take for granted today. When you have the chance to spend time with these mobile home park owners, you should cherish every minute and listen to every word. One of the best things about buying mobile home parks is the ability to interact with the Greatest Generation. Years from now, people will be jealous – not by the number of mobile home parks you own – but by the fact that you were able to talk with the Greatest Generation. They do not require any digging, trenching or wiring. They are completely solar, and all the power they need comes from the sun. They are virtually maintenance free other than changing the batteries every three years. They have a built-in photo cell, so you don't need a time clock. They turn on automatically when the sun goes down and stay on all night until dawn, even in the winter months. The lights are bright. (roughly 50W per lamp head) Many solar products are dull, and you barely get any illumination at all - these products shine like real electric fixtures. They are big. Each solar lamp fixture is 19" H x 10.5" W without the pole. Many solar products are much smaller than electric ones. These break the mold. They are made of powder-coated cast aluminum and sturdily built. They are extremely reasonably priced. 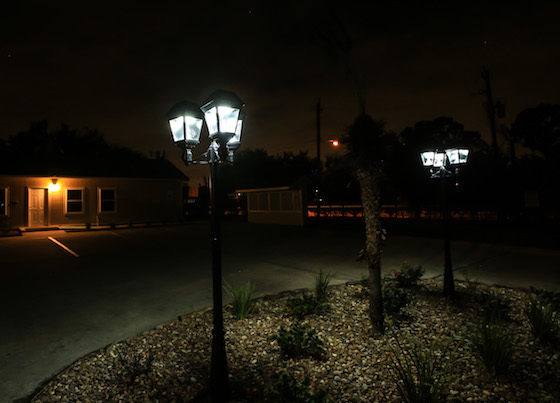 The Gama Sonic Imperial II solar lights draw a crowd at several shows every year, and we think that they are a perfect addition to any mobile home park. We're a happy customer and we think you will be, too. 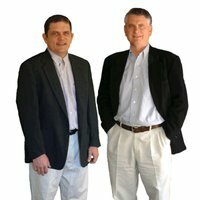 If you contact Matt, tell him Frank and Dave sent you! Take a look at at their website! Bing Crosby may have dreamed of a White Christmas, but park owners never do. Snow can be a real headache for park owners in northern climates, and can cause a real budget “buster” when it comes down frequently. So how do you properly deal with snow? Most park owners do not realize that salt is like kryptonite to both asphalt and concrete. Unbelievable, simple table salt can destroy concrete by creating fissures that allow in moisture and, as a result, ice that breaks up the concrete. The better alternative is sand. As proof of this maxim, look no further than our home office city of Denver. In Denver, they only allow sand on the streets and never salt, due to the potential damage it would have (and the fact that it snows constantly and would have constant distress from that quantity of salt). You have to acknowledge that safety is paramount, but that you are also on a limited budget. You want to plow just enough to get by, and not to out-plow the Ritz Carlton hotel. The problem is that now plowers have their own agenda and that’s making as much money as they can during the winter season. While the snow plower will tell you that you need to plow every time it rains 2”, the more appropriate level for most parks is 3”. One of the worst things you can do as a park owner is to enter into a monthly contract with the snow plow company. Your interests and theirs are not aligned. Instead, you need to only plow when you call them. If you leave it up to them to decide when to plow, you’ll probably pay two or three times more during the snowy season. Obviously, a truck with a giant blade on it driving through your park on slippery streets is an incredibly risky concept. As a result, you have to make sure that anyone who plows your roads has valid liability insurance, and in the amount that your insurance agent feels necessary to cover any potential accidents. Each year, there are a number of situations where the snow plow accidentally hits a car – make sure that such an incident will not cost you anything out of your own pocket. It’s a terrible idea to let your manager sign any agreement with the snow plow operator. For all you know, the plow owner has filled in the price two times higher than what you discussed with them. Make sure that any agreement concerning price or money that will be owed is signed only by you. That’s what email is for. If your manager signs the agreement – and the amount is wrong – the plow owner may be able to sue you and put lien against your property if you dispute the amount owed. Snow plowing is a real pain – but it’s also a necessary evil. Make sure to protect yourself from “busting” your budget, and from the snow plow operator advancing their agenda at your expense. The Salvation Army has been running commercials recently that lament the fact that most Americans stop all philanthropy after the Holiday Season has ended. We’ve been trying not to do that. And we’ve found that helping the community is a fun outlet for all kinds of energy. 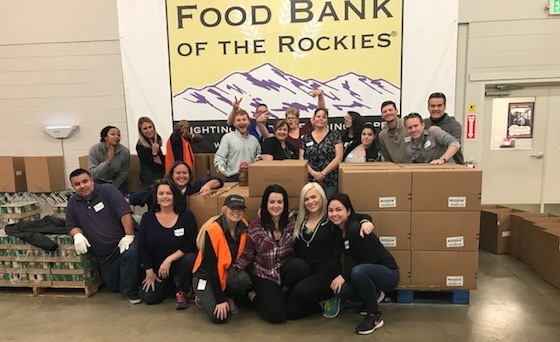 Recently, our team volunteered to help fill orders at the Food Bank of the Rockies. And we’re expanding our outreach in many ways in helping our park residents. If you haven’t tried giving of your time and money for a good cause, we urge you to do so in 2018. Who knows – you may get addicted to it. Obtaining a loan for a mobile home park can be difficult and time consuming if you do not know how to build an effective loan package, or which lenders to hit. And then there’s the unpleasant task of meeting with lenders and dealing with rejection, as well as knowing what terms are negotiable and how much you can push them. What’s the solution? For smart buyers, it’s MJ Vukovich at Bellwether Enterprise. MJ is one of the top loan brokers in the U.S. He goes out and gets the loan and all you have to do is pick which bank you want to go with from those that want the loan. It’s fast and painless, and the fee is around 1%, which is a real bargain. Best yet, you only pay on performance, with the fee due at closing. We’ve been using MJ with great success, and his real strength is in the “agency” arena with Freddie Mac and Fannie Mae, where his firm is a leading underwriter. Best of all, MJ is a third generation park owner, who understands the business and looks at the entire process from your perspective. We’ve all been stuck behind two 18-wheelers going 40 mph in a 70 mph zone. It’s called “hot-boxing” and it’s extremely frustrating and disturbing. But sometimes we can get “hot-boxed” in more than a highway environment. 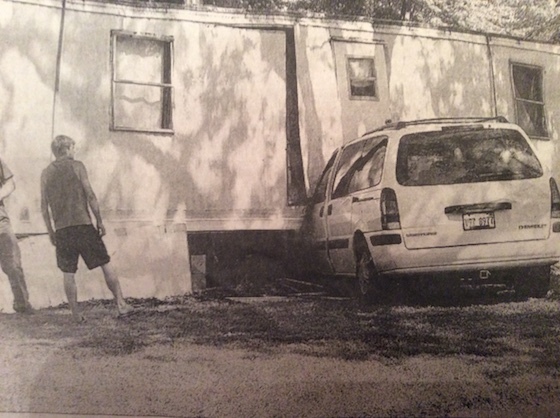 If you’re having this same problem in buying a mobile home park, let’s examine some of the fixes (which are far easier than separating those 18-wheelers). You cannot find a great deal unless you turn over a lot of rocks. Volume is the key to success. If you are not experiencing enough volume of deals to look at, it’s time to reassess your methodology. Don’t get into the trap of simply looking at deals that are online, found at MobileHomeParkStore.com or Loopnet.com. These can sometimes be of value, but are only the tip of the iceberg on deal availability. There are roughly 44,000 mobile home parks in the U.S., yet there are only roughly 800 listings online at any given moment – that’s only 1.8% of the total. You need to augment these online listings with contacting all industry brokers (there are roughly 100 of them that can be found on the “Brokers” tab on MobileHomeParkStore.com. But don’t stop there, as there are still three more ways to develop volume. One is cold-calling owners, another is direct mail, and the third is physically dropping by the park and/or owner’s house. If what’s blocking your progress seems to be the “pricing” of these deals, then there are several methods to get around this. The first is to remember that all prices are negotiable, and many sellers start the pricing extremely high in the hope that the buyer won’t know any better – we call it “fishing for idiots” – yet don’t expect to get anywhere near their asking price. Basically, there is probably no sector of real estate that has more elastic pricing than mobile home parks. So when you find a deal you’re interested in, don’t be turned off by the asking price. Give the seller your price and see what they do. We’ve had sellers drop their price by 50% before. Secondly, you need to think like a “deal maker” and not a “deal killer” – which means that you should focus on how a deal might be structured successfully and not simply the fastest way to “kill” it. Then you can present this to the seller for their opinion. Often, a deal that would be “killed” can be saved through seller financing at attractive terms, or with a Master Lease with Option arrangement, or perhaps a significant rent raise or the renovation and sale of a number of vacant park-owned homes. The third plan of attack is to try hard to find deals that are “off the radar screen” of the bulk of buyers, and focus on sellers who may be less sophisticated on their asking prices. These can be found with broker “pocket listings” as well as the rewards of cold-calling and direct mail efforts. If you have been blocked from buying a mobile home park based on simple indecision, there are two great methods to solve this issue. First, learn what you’re doing. For many people, indecision is the byproduct of self-doubt. While the mobile home park business model is fairly easy, there are certain items that can derail any park from being a success. Learn those things. By knowing what you’re doing, you’ll gain faith in yourself and your opinions. The second is to put on your lab coat and due great diligence. Think of each deal as being subject to intense, scientific scrutiny and the results of this study will affirm whether or not to proceed. Benjamin Franklin knew the importance of this when he said “diligence is the mother of good luck”. If you know what you’re doing and you do great diligence, your indecision should evaporate. Everyone has a fear of making a bad decision, and committing to something that they later want to retract. One of the best ways of overcoming this obstacle is to come up with three scenarios: 1) the best case 2) the worst case and 3) the realistic case. In the best case, you are examining the most positive potential outcome (typically pushing the rents to maximum market rents, failing all vacant lots, and cutting expenses as low as possible. In the realistic case, you look at what would happen if you fail to hit the perfect case, but still get positive things done. But the worst case is what would happen if the whole deal went bad (within reason – don’t postulate that a meteor hits the park). There’s an old saying “focus on the worst case because the best case can take care of itself”. That’s pretty much true. If you watch your downside, you’ll never be shocked or disappointed, and will keep from putting yourself into a bad position. When you know that you have the worst case identified – and are aware of what the realistic and best case performance might be – you will find your fear of “pulling the trigger” on closing of the deal will evaporate. Don’t allow yourself to be “hot-boxed” in finding and buying a mobile home park. Identify what is holding you back and make proactive steps to cure the problem. Then honk and wave when you get around the obstruction. What Is In A Well-Equipped Office? 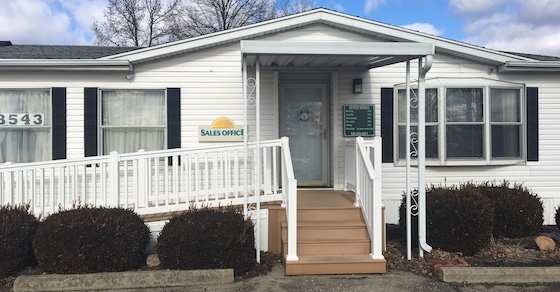 This is a well-positioned and attractive mobile home park office, set inside a double-wide at the entrance to a park. But although it looks great from the outside, the more important question is “what’s on the inside?” So what would you find inside a well-equipped park office? The starting spot for a well-equipped park office would be a dry-erase board that has several columns. The columns would be “lot #”, “number of bedroom and bathrooms”, “rental monthly amount”, “cash price”, “status”, and “date available”. You then take all of your vacant park-owned homes (including ones that you have received notice on but are not vacant yet) and list them on this board. This is an important fixture because it serves two purposes: 1) to let customers know what’s available without the manager trying to memorize it (which never works) and 2) to remind the manager that they have vacant homes and what they need to be doing to get them out the door. While the internet is obviously very powerful, there are times where printed material still reigns supreme. Every office should have, at a minimum, a stack of 8 ½” x 11” flyers that a customer can walk out with – or that can be left in the literature rack at a local mobile home park dealership. In fact, you can have several flyers, each with its own purpose. They would include “renting a home”, “buying a home”, “renting a lot”, “renting a lot for your RV”, “renting a storage unit (if applicable)”. Better yet would be a color folder that you can place these inserts into. For customers that are ready to buy or rent, you need to have applications at the ready. 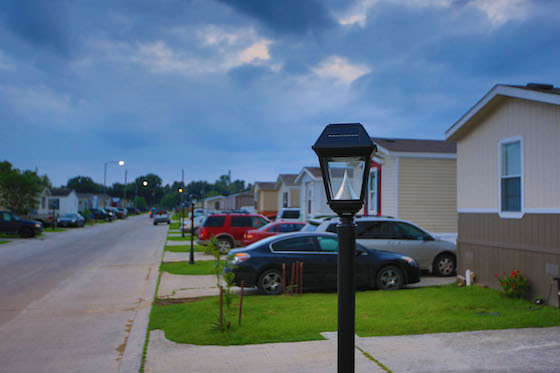 Remember that many mobile home park customers are extremely point-of-purchase, and if you are not ready to get the process going immediately, they may lose interest and just drive over to a different park. The manager should also have the entire application process down to a fine art, so there are no unnecessary delays. For those customers who are ready to sign up – and have either been approved by the credit company or not required to have a criminal/credit screening (such as an RV) – you need to have all leases at the ready, properly filed by asset type. Make sure that you, as the owner, have approved all of these leases as far as the monthly amount, due date, late fees, length of lease, and other key items, as well as the attached park rules. There are some notices that are required to be posted publicly by law – such as Fair Housing – and the office is the logical place to display these notices. Contact your state MHA to get a list of what these required notices are, and where to obtain them (some you can get for free or for a small charge from that government agency). This is the most important fixture of any park office: the manager. Your ability to hit and beat your budgets is often partially reliant on the quality of your manager. Make sure that you hire the right person, train them well, and then monitor them closely. There is the perfect person for every park manager job out there, you just have to find them. We have burned through several people in year before, until the found the right fit that will stay on and succeed for years. If you have a manager (and you have to) you also need to establish office hours. And you might want to consider that one of those days that you are open be on Saturday. Most park offices – particularly if you have substantial vacant park-owned homes – are better served to be closed Sunday and Monday, then Saturday and Sunday. Saturday, for many customers, is the ideal day to tour new housing options. Also make sure that office hours are a little later on at least one or two days a week, since customers can often only come out and look at mobile homes after work. A good mobile home park office has as much right on the inside as it does on the outside. It serves many uses, ranging from embassy to file room, and doing it right is a critical part of your ability to succeed. Everyone loves the “tiny home” shows on HGTV. But there’s a problem with those unusual little houses. Despite their fun mystique, there are legitimate legal and financial considerations that need to be addressed. 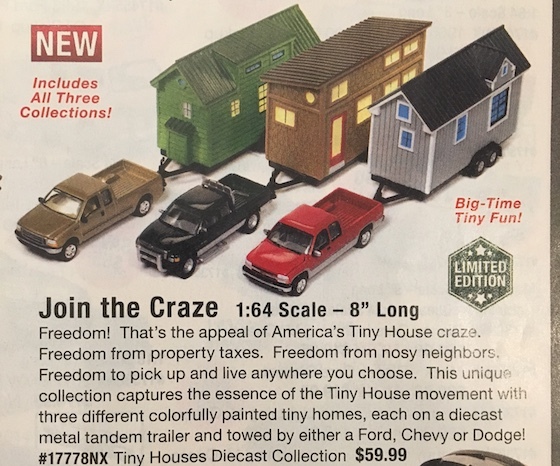 So what are the problems with “tiny homes”? Starting in 1976, all mobile homes must have a HUD seal, affirming that they were built in conformance with HUD standards. Tiny homes typically do not have these seals, as they were not built in factories that are HUD licensed. This creates a significant problem, because only structures with HUD seals are deemed correct for full-time living. Without that HUD seal, you cannot get power connection in most mobile home parks. At the same time, they don’t really fit the requirements at most RV parks, in which you are not supposed to live there full-time, or at least be in an RV. And the real problem is when you have a young family living in a tiny home inside of an RV park, as cities typically do not allow you to live full-time in RV parks and put your kids into school with that address. Since tiny homes are not really technically legal in most areas, some cities have begun to grow hostile to the concept. There have been reports of cities red-tagging these structures, since they don’t really fit the guidelines of the city ordinance. The whole situation is reminiscent of the ride-sharing groups such as Uber, which may not be technically legal but are popular with the masses, so the authorities look the other way. However, unlike Uber, the average person could care less about mobile home park residents, and cities are not buying in to the concept with robust passion. The final problem with tiny homes is that they are very expensive compared to regular mobile homes of the same size, or even larger in square footage. Many tiny homes that you see on HGTV cost $30,000 to $50,000 – and that’s for a home that’s often only around 500 square feet. For that same price, you can buy a roughly 1,000 square foot mobile home from a factory. And you don’t have to wait for months to get it. The best manufacturers, such as Clayton, are already starting to produce HUD-approved tiny homes. More than likely, the path of the tiny home movement will be to embrace these fully-legal HUD coded tiny homes – at much lower price per square foot – and that solves the legal problems for occupancy. Meanwhile, the demand of these customers will sway mobile home design to include some of the better attributes of the top-end tiny homes. The net result will be a more compelling product for the younger generation, and a re-birth of the “hip” factor in mobile home parks. That’s a pretty happy ending, in our opinion. The tiny home movement is currently filled with challenges and risks. However, the end product will be highly beneficial to the consumer, the design of mobile homes, and the image of mobile home parks. Plus, we’re big fans of the shows, as they promote the concept of living in smaller spaces and with a bent towards conservation and a departure from materialism. Perhaps some day there will actually be a positive television show about living in mobile home parks as a result of this phenomenon. Have You Listened To The 2018 Affordable Housing Summit Yet? In World War I, armies had to send up dirigibles to see what was on the horizon. These spotters, hanging in baskets under the balloon, would signal what they saw. Without this information, you could not function as a General. 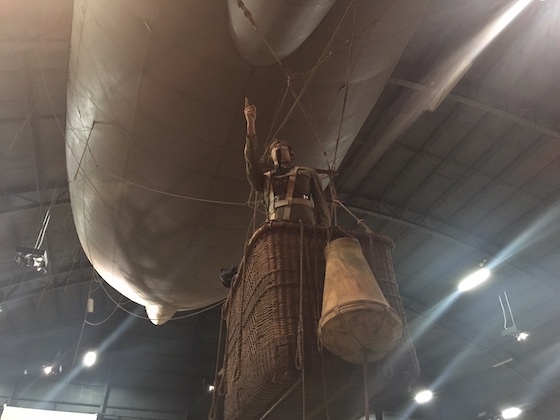 The same is true today – but we’ve swapped the balloon spotter with a more advanced method. The 2018 Affordable Housing Summit features nearly 20 hours of content on the latest status and future predictions on the industry’s most important topics – from cap rates to consolidation and from financing to firing managers. There’s no way you can make good decisions going forward without knowing what’s on the horizon. We’ve been producing the Summit series since 2010, and this year is, by far, the best. It costs just $199 (that’s only $10 an hour) and if you can’t walk away with at least ten great ideas from these discussions, then we’re amazed.Get The Recordings Here Today! 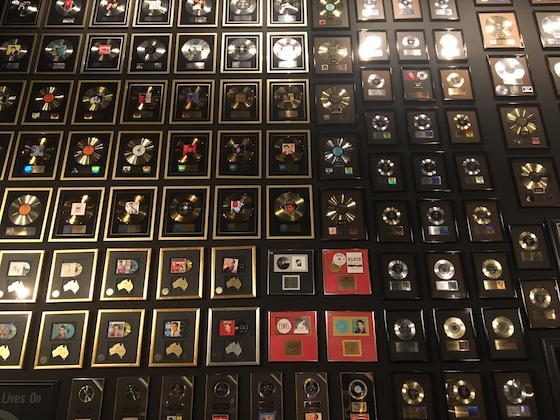 This is a wall of awards in the Elvis Presley Museum in Memphis, Tennessee. Ranking performers based on number of records sold is easy. But ranking mobile home parks is not. While many other sectors of real estate are subjected to a ranking based on the “star system”, it has never worked (and never will) with mobile home parks. Why is that? There are a number of reasons. A mobile home park has an endless number of variables – far more than a hotel or an office building. Those are given their “star” value based on quality of construction, amenities and how new they are. Mobile home parks, on the other hand, are just pieces of land and their most important attribute is location. On top of that, each mobile home is independently owned, and varies in both age and condition. The sum of all of these thousands bits of data is the quality of the mobile home park as an investment, and that’s far too complicated for a simple “star system” to comprehend. In most real estate “star systems”, the highest “stars” go to the newest properties. This is definitely true for office, hotel, apartment, self-storage and industrial properties. However, mobile home parks have not had any significant new construction since the 1970s and, as a result, this attribute is meaningless. On top of that, there is a general rule that the older the park the better the location, and that means that the best locations often have the oldest infrastructure and smaller lots. When you take the ability to build new projects out of the line-up, the value of a “star” seems pointless, as the most important of a high ranking “star” value – age – does not apply, and there is even an inverse relationship of age of community and quality of location since cities have been hostile to mobile home park construction for nearly half-a-century now. You cannot have a “star” system without a governing body to ensure that nobody cheats. The mobile home park industry has no such group and, as a result, most owners simply make up their number of “stars” to serve their own purposes. How many times have we seen a dirt-road, rural property that the seller claims is “4-star”? Plenty. And since mobile home park owners find the “star system” irrelevant and silly, they will never fund a group to assign and enforce a “star system”. Many new entrants to the industry are unaware that the “star system” was officially tied before and failed miserably. It was Woodall’s directory that attempted to rank all mobile home parks on a “star system” back in the days when RV parks and mobile home parks were one in the same, and then later as they separated as far as purpose. Woodall’s ending up giving up on the concept, and thank heavens they did, as they ranked mobile home parks strictly on number of amenities – something that could not be further from what’s really of value in a mobile home park investment. There will never be a successful, fairly applied, “star system” for mobile home parks – and that’s a good thing as the basic concept does not overlay well to our industry. While we use “stars” to choose our hotel reservations, that’s about the limit of the use of “stars” in our world. One of our big pushes in 2018 is to enhance the quality of life for our residents, by focusing on the concept of building a “sense of community” in every property. And we’re finding ideas all around us. So what are some of the ideas we’ve seen recently, that might translate well into your property? 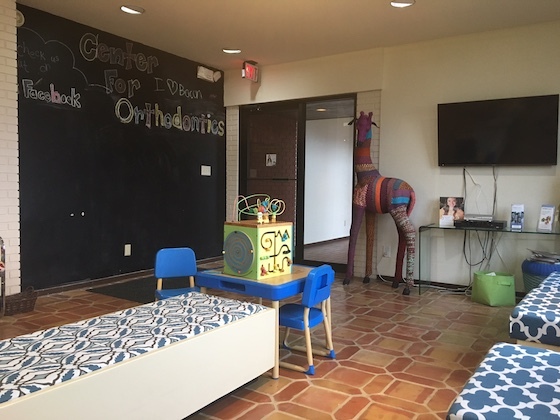 The photo above is of a waiting room at an orthodontist’s office. What we thought was interesting about this office was the chalkboard wall. This allows you to impart a frequent new message, and even invites resident participation (as long as it is monitored). You saw the same concept in Tony Hsieh’s famous Airstream Village in Las Vegas (the billionaire founder of Zappos.com that owns and lives in a mobile home park), where he has a prominent wall for residents to place new ideas to make the community better – or just put inspirational thoughts or draw a picture. Take notes the next time you drive through a city park, or even a new rest stop along the highway. What do you see? We see a focus on outdoor dining, such as picnic tables and even outdoor grills. A recent RV park study found that the #1 amenity for most RV owners is outdoor cooking. Maybe we mobile home park owners should learn something from that study? In many city parks you will also see pavilions – open air structures that are just a roof held up by four or more poles. It offers shade in the summer and shelter from the rain when it’s cloudy out. This could serve as an alternative to the traditional park clubhouse, offering an area for congregating that is inexpensive and requires no expensive heating or cooling. What do you see at most schools? Athletic fields. Sports are a fun way to foster relationship-building on the part of your residents. While basketball courts require expensive concrete and goal construction, soccer fields are just a mowed field with two all-weather nets. Did you see that water park recently that had a giant crowd standing under a spray of water from its infrastructure while waiting for a giant bucket of water to pour down on them. This is basically called a “splash pad” and it may ultimately replace the swimming pool, as it seems people prefer to stand around and get sprayed with water than to jump into a pool. Why is that? Studies show that adults are more comfortable with aquatic environments where it’s impossible for kids to drown, and kids prefer the excitement of being sprayed with water than the boring concept of floating in a pool. On top of that, both kids and adults like the easy nature and control of deciding how wet to get (a pool is an all-or-nothing proposition) and the fact that no knowledge of swimming or lifesaving is required. What events do you attend? Watch for the events that you see ads for and see if they are adaptable to your mobile home park. BBQs have become popular ways to get residents together, but there are many more creative ideas out there. You could hold everything form an art festival for kids to a pet parade. We held an event last year in which we had Home Depot, Lowe’s and other vendors offer free food and home remodeling tips and services, and it was a huge win/win for everyone. Ideas to improve your resident’s sense of community are all around you When you see good ones, write them down. If you see exceptional ones, let us know, too. Building the amenity of “community” should be high on any park owner’s priority list for 2018 and beyond. What Should Be Your Initial Counter Offer Be On A Mobile Home Park? 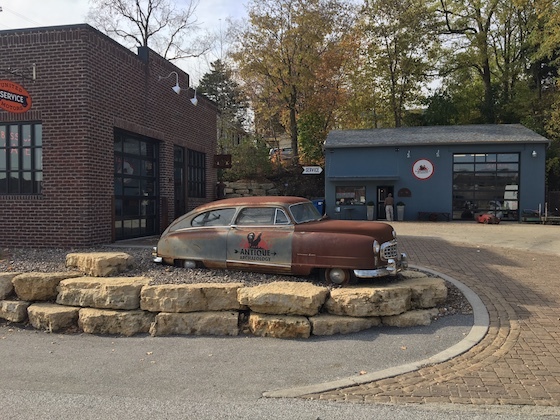 This is a photo of the American Pickers headquarters in Le Claire, Iowa. On the show – which is one of our favorites – you see continuous back-and-forth of negotiating on objects ranging from classic cars to rusted lamps. The first step, in any encounter, is for the initial asking price to be stated. The buyer traditionally wants the seller to name the price, as they are hoping for a bargain. But sometimes that first price is more than the buyer wants to pay. When this occurs, how does the buyer respond? Your rebuttal needs to reflect the actual value of the property. It has nothing to do with the price the seller first throws out. If the seller says he wants $2 million, and your analysis says it’s more like $1 million, then there’s no point in working from the seller’s number. Instead, your counter offer should be 100% based on true value, not the price that’s arbitrarily set at the onset. You see this often on American Pickers when they look at classic cars for sale. In one episode, the owner thought a 1920’s Rolls Royce was worth $100,000, while an expert the Pickers called said it was more like $20,000. The seller’s number was absolutely worthless as an initial reflection of value. Step two is that your rebuttal should be based on remembering that negotiation is a series of back-and-forth maneuvers, and the seller is going to want to get more no matter what you see. With that in mind, you need to start low so that you can end up where you need to be. If you counter with the exact price you have in mind, it’s a given that the final price will end up higher than that. You’ll see that on American Pickers when they see an old gas station sign they think is worth $300, so they offer $200 so the seller can drive the price up to where they think it should be. What if the seller’s price is actually lower than what you think the price should be? Don’t ever let them know, as that’s a sure-fire deal killer. Your reaction to the seller’s price has the ability to affirm that they made the right selection, and if you look horrified, it lets the seller know they’ve done a good job of valuing their property. So even if they throw out a price of $200,000 on a property worth $600,000, your response should be “that’s pretty high. Would you take $180,000?” The seller will never be happy unless they think they’ve driven a hard bargain, so let them think just that. On American Pickers, you’ll see that they always have the same pained expression no matter what price the seller tosses out. That’s just part of their negotiation “act”. If you’re ever in Le Claire, Iowa, you can drop by the American Pickers store. It’s the headquarters for the classic art of negotiation. These tips should get you started on the right foot. Mobile Home As Crime Stopper? This is how a high speed chase in Illinois ended up.